As member-consumers receive their first winter bill, this is a frequently asked question. Here’s some insight into understanding why your winter use may differ from the rest of the year. Winter is notorious for keeping us indoors during inclement weather, resulting in higher home appliance use and higher thermostat settings. When it’s colder outside than inside, your heating system has to work harder to maintain the temperature setting inside the home. the Department of Energy (DOE) recommends setting your thermostat at 68 F in the winter. This is a 10 F decrease from the setting of 78 F as stated in the question above. Changing this setting could save as much as 10 percent on a member’s heating cost. You may be thinking “that’s way too chilly for cold winter nights!” You can certainly set your thermostat higher than 68 F. Just remember, the harder your furnace has to work to maintain the temperature setting inside the home, the higher your use will be. If you drew the short straw to host the holiday party this year, remember that having increased visitors in your home increases energy use. Maybe you have children home from college or on winter break from middle school. Keep in mind that they are utilizing multiple appliances throughout the day; increasing the normal amount of electricity your home uses when you are away at work and your home is empty. 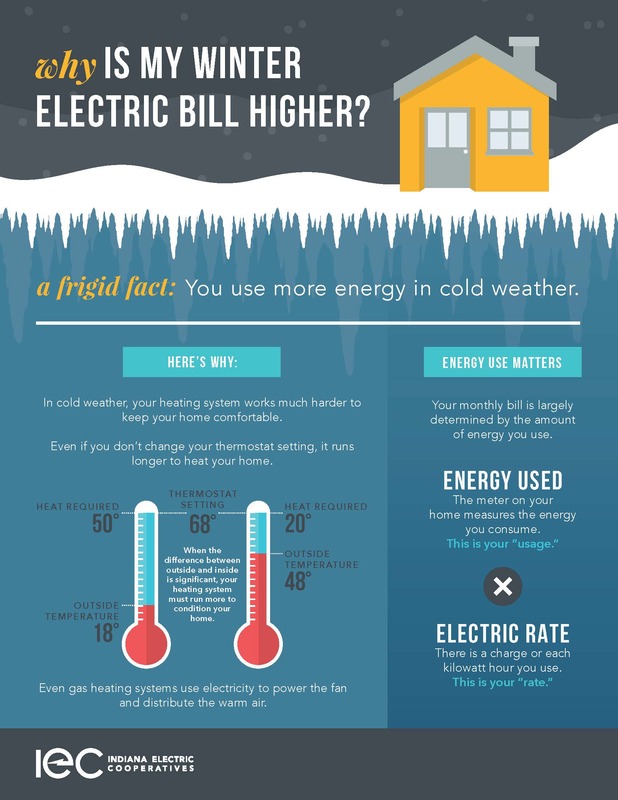 Those additional showers with hot water, cooking with your electric oven, or snuggling up beside your electric space heater can all attribute to your higher energy bill in winter. Utilize your cooperative’s electric use app to target periods of high use. The hour-by-hour readings allow member-consumers to pinpoint when you’re using more electricity. They can also identify the appliance(s) that may be causing the increase. When you use electricity is as important as how much energy you use. If you are willing to adjust the time of day you use your high use appliances, you may want to participate in your co-op’s Demand Side Management Program and move to the Time of Use (TOU) rate. Contact your local electric cooperative for more information about these programs. If your home is not well insulated, or your windows or heating/cooling ducts are leaking, your use may be higher. Simple fixes, like caulking around windows and doors, sealing your heating/cooling ducts, or adding attic insulation can make a big difference in the energy efficiency of your home. Interested in additional resources and information about energy savings around your home? Contact your local electric cooperative to schedule a home energy audit. Your electric co-op offers many incentives and rebates. Visit your local cooperative’s webpage or call for more information.